I was hesitant about spending 30 dollars on a single playmat but in the end I am glad I did. 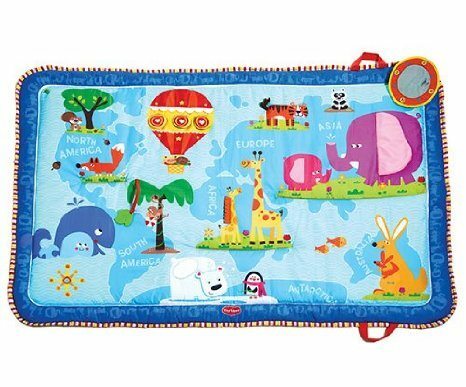 Tiny Love Discover The World Mat is very cute, and it is big enough for the baby to roll over and try to grab different toys. My daughter loved it when she was a baby. From earliest age to around one year she practically did everything on it. She was using it almost every day until she started to walk. Tiny Love Discover The World Mat has everything I wanted for a baby toy – it is big, soft, washable, and has a cute design with a few built-in activities. It is plush enough to provide a little extra padding on hard floors. The best feature is definitely the size and material. Colours on the mat are very vibrant and it has a few other things that will certainly entertain a small child. You can also use it when going outside in nature. The best feature is that it is easy to wipe up spit-ups and drool. It is machine washable and it air dries very quickly. Because I loved it so much, I decided to do a Tiny Love Discover The World Mat Review. We also bought this for our friends’ babies when we went to see them for the first time, and as we know, all of them liked it. What not to like? *And just for full disclosure, there are affiliate links in this posts “Tiny Love Discover The World Mat Review” That means that I’m sharing something that I think is helpful, and if you make a purchase through the link, I earn a little bit back. No extra cost to you, and just a little help for me to pay for the blog expenses. What a great mat! I love how portable it is too! I just might be picking this up for a baby shower I am going to next month.